Reference: Nussbaum, D., Scott, S., Waddy-Smith, B., & Koch, M. (June 2004). Spoken language and sign: Optimizing learning for children with cochlear implants. Paper presented at Laurent Clerc National Deaf Education Center, Washington, DC. Images retrieved from HERE. 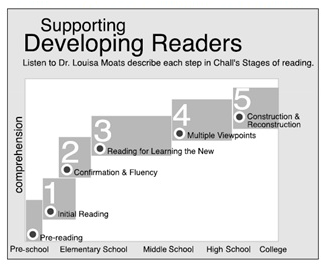 Image Source: Scholastic Red Teacher Resource, "Stages of Reading"
Click HERE to download the K-Eng IV Vertical Alignment. American Reading Forum Annual Yearbook [Online], 2012, Vol. 32. 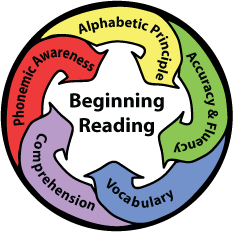 Read the The Reading Teacher article to learn about the importance of selecting appropriate-leveled text. an increase in the use of self-correction strategies.